Most people think of bean varieties as climbers and bush beans, but they’re a very diverse species with more than 40,000 bean cultivars around the world. Among the most amazing are the beans grown for drying, with incredibly beautiful colours and forms. Speciality store Rancho Gordo in the US has spear-headed a bean revival seeking out rare and unusual heirloom and open- pollinated varieties and making them available to chefs and home cooks. In Australia we have a very small selection available to us. And as the biosecurity doors have closed on importing more, we need to be on the lookout for those that remain and get serious about making sure they stay with us. While most of us sit down to fresh green beans on a regular basis, meals cooked with dried beans – apart from the ubiquitous baked bean – are far less common, and we’re missing out. Beans are the meat of the vegetable world! They’re a high-protein, high-fibre source without the accompanying cholesterol and saturated fats of meat. They’re often called an ‘incomplete’ form of protein as they have lower levels of essential amino acids, tryptophan and methionine. These can, however, readily be found in the dairy, seeds and nuts that usually accompany them. Beans are a versatile ingredient that can form the basis of delicious casseroles, stews, chilli bean pies, frijoles, nachos, salads, dips, soups and more. One cup of dried beans cooks to two. They’re easy to store, don’t go off, and can, like potatoes, take on flavours such as chilli, garlic, cumin, coriander, oregano and tomato and create affordable, nutritious, delicious and filling meals. People may fear including beans in their diet, concerned they’ll become a gaseous giant. To reduce or eliminate flatulence soak beans overnight, discard the water, add fresh water, bring to the boil and gently simmer for at least half an hour. Longer is better. Then leave the pot to cool. A word of caution – dried beans should never be eaten raw as they contain a toxin called Lectin. Cooking denatures the toxin making them safe to eat. 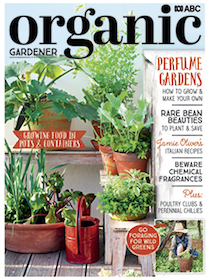 For more on heirloom beans in Australia, where to get them and how to grow and use them, get the latest copy of Organic Gardener magazine, Issue 104, OUT NOW!